1. Lagundi (Vitex negundo) - known in English as the "5-leaved chaste tree". It's main use is for the relief of coughs and asthma. 2. Yerba Buena (Clinopodium douglasii) - commonly known as Peppermint, this vine is used as an analgesic to relive body aches and pain. It can be taken internally as a decoction or externally by pounding the leaves and applied directly on the afflicted area. 3. Ampalaya (Momordica charantia) - known as "bitter gourd" or "bitter melon" in English, it most known as a treatment of diabetes (diabetes mellitus), for the non-insulin dependent patients. 4. Bawang (Allium sativum) - popularly known as "garlic", it mainly reduces cholesterol in the blood and hence, helps control blood pressure. 5. Akapulko (Cassia alata) - also known as "bayabas-bayabasan" and "ringworm bush" in English, this herbal medicine is used to treat ringworms and skin fungal infections. 6. Ulasimang Bato (Peperomia pellucida) - also known as "pansit-pansitan" it is effective in fighting arthritis and gout. The leaves can be eaten fresh (about a cupful) as salad or like tea. For the decoction, boil a cup of clean chopped leaves in 2 cups of water. Boil for 15 to 20 minutes. Strain, let cool and drink a cup after meals (3 times day). 7. Bayabas (Psidium guajava) - "guava" in English. It is primarily used as an antiseptic, to disinfect wounds. Also, it can be used as a mouth wash to treat tooth decay and gum infection. 8. Sambong (Blumea balsamifera) - English name: Blumea camphora. A diuretic that helps in the excretion of urinary stones. It can also be used as an edema. 9. Niyog-niyogan (Quisqualis indica L.) - is a vine known as "Chinese honey suckle". It is effective in the elimination of intestinal worms, particularly the Ascaris and Trichina. Only the dried matured seeds are medicinal - crack and ingest the dried seeds two hours after eating (5 to 7 seeds for children & 8 to 10 seeds for adults). If one dose does not eliminate the worms, wait a week before repeating the dose. 10. Tsaang Gubat (Ehretia microphylla Lam.) - Prepared like tea, this herbal medicine is effective in treating intestinal motility and also used as a mouth wash since the leaves of this shrub has high fluoride content. If possible, buy herbs that are grown organically - without pesticides. Medicinal parts of plants are best harvested on sunny mornings. Avoid picking leaves, fruits or nuts during and after heavy rainfall. Leaves, fruits, flowers or nuts must be mature before harvesting. Less medicinal substances are found on young parts. After harvesting, if drying is required, it is advisable to dry the plant parts either in the oven or air-dried on screens above ground and never on concrete floors. Store plant parts in sealed plastic bags or brown bottles in a cool dry place without sunlight preferably with a moisture absorbent material like charcoal. Leaves and other plant parts that are prepared properly, well-dried and stored can be used up to six months. Use only half the dosage prescribed for fresh parts like leaves when using dried parts. Do not use stainless steel utensils when boiling decoctions. Only use earthen, enamelled, glass or alike utensils. As a rule of thumb, when boiling leaves and other plant parts, do not cover the pot, and boil in low flame. Decoctions loose potency after some time. Dispose of decoctions after one day. To keep fresh during the day, keep lukewarm in a flask or thermos. Always consult with a doctor if symptoms persist or if any sign of allergic reaction develops. 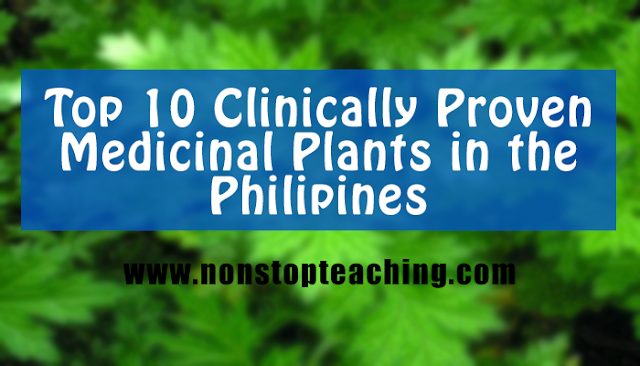 Here are the medicinal plants in the Philippines that are clinically tested and proven by the Department of Health (DOH). The list includes the medicinal plants for coughs asthma, body pains, high blood, skin deceases, arthritis, infection, tooth decay, urinary stones, bad breath, and etc.